"...eh? You are back to being siblings?" "Didn't I tell you that for a while now?" A vast grassland was spreading in every direction, likely reaching the ends of the earth. Wind faintly caressed the grass producing one, two waves of dark green. And standing in the middle of the spreading glittering wave, were two girls. One of them, was wearing a mysteriously blended kimono. The other one, was wearing something that looked like a white coat. "U〜mm, I knew you have a brother, you’ve always been bragging about it ever since we first met." "Yes. He’s a brother a little sister like me can be proud of." The girl with chestnut coloured hair who wore a white coat had a troubled expression. Her hair that was reaching her shoulder blades, swayed lightly in the wind. The other one, the 『Little Sister』, wore a strange, modified kimono. She had glossy black hair, long enough to cover the entirety of her thin back that was shaped like a piece of art. And above all, there was one more characteristic – she had clear and serene sky-blue eyes like a lapis lazuli. "Little Sister longed for this day to come. Finally being able to live together with Brother. Can you understand the feelings of a little sister who, for 8 years was, aaa〜〜〜〜lways waiting for this day? No, Rucchan who is not a little sister, cannot understand it." "...eh? Is it only Rui-san who thinks what she heard was weird?" Being unable to meet their precious person——she didn’t seem to hear it like that. Rucchan, Saionji Rui, showed an even more troubled expression. Looking at her friend’s expression, Fuyuki regretted her fierce outburst. "It’s not strange at all, every little drop of Little Sister’s blood, every strand of her hair, exists for the sake of her brother. And her brother’s everything, from the tips of his toes, to the top of his head, belongs to Little Sister. Isn’t that common sense in this world?" "No, I’ve never heard of such common sense. Rather, aren’t siblings like that scary?" "How rude. What do you know about little sisters, Rucchan?" "Certainly, Rui-san isn’t a little sister, however, at least she knows it’s weird." Lately——she thought that her best friend really loved her brother. Ever since she met her, she heard so many stories about her brother, anyone listening to it would notice that. Indeed, Karasuba Fuyuki is a brocon, and an extreme one too. The fact that she had a very small body aside, ten out of ten men would find her attractive. "Just now, I’ve had a really bad feeling. Did you think of something rude?" "Ahaha, there’s no such thing." And she was quite sharp. Fuyuki looked at Rui who broke out in a cold sweat after lying to her. However, her line of sight was drawn lower as she thought——and stopped at the bulging out chest that couldn't compare to her own. "...it’s all right, Little Sister. You know your size is just right for your height." "Don’t scowl like you want to take revenge on your parents when you say that." Thoughtlessly, Rui got quite scared because she had a well-endowed body. It could not be helped, because for girls in puberty, the size of their breasts was a symbol of status. Especially, when comparing her breasts with her friend's who was the same age, Fuyuki's turned out quite pitiful. "...I’m not envious at all." The two of them walked through the vast grassland that does not exist in modern Japan. Although, because of that topic, the atmosphere around them might have become a little bit threatening, they were getting along quite well. "Now, what did we talk about again?" "Ah, that’s right. So, what do you mean you’re back to being siblings? You’re saying it as if you weren’t siblings until now." "Hmm, Rucchan, how much did I tell you about Brother?" "A lot, and in detail. I imagine him to be an amazing person after hearing Fuyuki’s stories." "And about Little Sister’s home?" "Your parents died 8 years ago and you were picked up by the Karasubas, or something like that." She was lucky to be taken in by the Karasuba group, which was a leading network company in the world〜, is what she thought. Though she didn’t know about her daily life because she never met her best friend outside of the Elysion, she was definitely living quite a wealthy life. "If you know that much, the rest is simple. Brother and Little Sister were taken to separate houses and were forbidden to meet ever since." "In other words, for whole 8 years?" For Rui, learning that, was the biggest surprise today. And this brocon little sister endured such long period of time well〜, that's one. The other was, why does she yearn for him so much even though they haven’t met in 8 years〜. Didn't she consider he might have changed at all? Moreover, it’s been 8 years. There’s no telling how he grew up. Considering the little sister’s looks, her brother couldn’t be ugly, however, there was no way of knowing how his personality was. "I’m not worried at all, in the first place, we’ve been in touch since last year." "Umm? Weren’t you forbidden from meeting each other?" "We didn’t meet, we spoke face to face through the terminal." "...The Karasubas overlooked such a simple thing?" "No way. I’m happy that we met in the cyber world, as expected the monitoring was very strict, I had no choice but to hack Karasuba headquarters and rewrite the terminal monitoring program. Understanding the program structure, camouflaging anti-monitoring measures, cracking security... and it took me 7 years to skill up." "No, you’re talking about doing something crazy hard as if it was something simple? Can Fuyuki do such a thing?" The world’s biggest networking company, 『Karasuba』, hacking into its headquarters with 7 years worth of hacking experience, a girl at the young age of 15. Just for the sake of contacting her brother. "...Oh well, that’s fine. It can’t be helped, now that it's done. So, why were you forbidden from meeting in the first place? Was the relationship between the households you were taken into that bad?" "That’s one of the reasons, the main reason was to prevent both of us from escaping. Because, Little Sister always said that she wanted to live together with Brother." "...in other words, they were concerned that you would elope. No matter how you look at it, you’re siblings so that’s——"
"That’s why we had to wait 8 years before we could run away." "Yes. Because it’s the only way for me to be together with Brother." Fuyuki said to Rui, causing her to be stunned in amazement. Despite her repeating brother brother brother-brother-brother for years, she didn’t think it would go that far. "That means the property nearby you told me about? Is that——"
"Ah, I didn’t tell you yet. I’ll be in your care from tomorrow onwards." "Do you intend on moving away and making a runaway declaration at once?" "We already have enough money for living expenses, it’s a good time as we are about to enter high school. Also, we don’t intend to – we already did. Little Sister is currently in a business hotel." "...You’re lucky that Karasuba didn’t find you." Fuyuki was a genius programmer, and a hacker. The Karasuba group won’t let her out of their hands because she’ll yield profits. They won’t let go of her as long as she continues to do so. "I’ve stopped Karasuba main server just before, giving myself time to move. And, while I was at it, I made a change in the family register, Little Sister is no longer 『Karasuba Fuyuki』." "Oh, I’ve also infected it with a virus that will not allow it to recover that easily. Little Sister’s special, it will take at least three days to remove it." "That’s a billion... no, the damages might be even worse." "Little Sister left that house now, I don’t know them anymore. 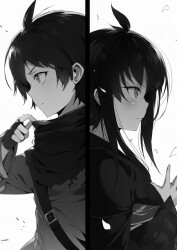 In the first place, Karasuba were the ones who pulled Brother and Little Sister apart, I resent them to the bone." The dark emotions Fuyuki harboured could be seen in her vividly coloured pupils. She actually held techniques good enough to stop a world-renowned cyber company, and the intent to perform such a thing without hesitation. A chill went down Rui’s spine. Trying to shake that thought away, she changed the topic. "Also, what about your brother? He ran away from home too, right?" "Yes. Brother is heading to this hotel today, he should have arrived in the city by now——"
She stopped, stood still, and was looking towards the sky. A distant, crystal clear, and cloudless fantastical sky spread in every direction. It was as if her eyes saw the other world in the distance, the real world. "I’m in the middle of running away from home." It was time for Fuyuki’s and Rui’s encounter in the cyber world to end. A large Japanese-style building in the mountains far from populated areas. Though the mansion was usually silent, inhabited, and wrapped in the darkness of the night. That day, its appearance was different from usual. Echoing and cutting through the darkness were sounds of gunfire and metal crossing each other. "Pursue him, don’t let him escape in the name of Renjou!" Men belonging to the military, instructed by their leader, on orders from their commander were chasing after a single boy that was running away. He had black hair that was suitably trimmed. The good looking boy had a fearless expression. Aware that pursuers were approaching from behind, he ran through the long corridor. Even as he ran as fast as the wind, his sky-blue eyes reflected light like a lapis lazuli stone. "Geez, how disciplined. Unless I do something I’ll be caught!!" After he muttered these words a projectile was shot from behind. The number of pursuers increased to ten men, he judged it with his eyes glancing as he ran. All of them looked awfully rough and held large handguns. The dozen from before, all with a military gun 『Blaster』, the gun's application depended on the type of bullet used, jumped out. Despite hearing the tone of voice of the soldier blocking the front, the boy was completely relaxed. Even though the bullets used were configured to be anti-riot paralysis ones, his expression didn’t look like someone’s at whom 10 guns were aimed at. In front of him, a person who looked like the commanding officer of the pursuers stepped forward. "It’s about time, could you please surrender, young master." "It’s an interesting joke, Kasai. Did you think you could catch me with something of this degree?" With a fierce smile, the boy turned his body slowly to the side. His posture was very close to a natural stance, it wasn’t enough to be called a proper stance. However, the men surrounding him could not hide that they were shaken by the keen spirit he emitted. Of course, they were familiar with the boy in front of them. And with the fact that he should not be judged by his appearance. They knew very well about the tremendous abilities he was hiding. "Certainly, normally even a hundred won’t be a match for the young master. However, even if we don’t have a thousand with us now, we have obtained permission to use blasters against you... I think that’s enough for us to win?" "Ho〜, you sure have a lot to say. I’ll give you advice out of consideration of your spirit. If you want to compete with me, at least use particle cannon mode and use live ammunition. Even ten thousand paralysis bullets can’t stop me." "...then, I’ll take you up on those words. Release the second restriction of the blaster, everyone use blast mode!" "K-Kasai-san is crazy, blast mode is used against large machinery such as tanks and battleships, if it even grazes a human there will be no trace of him left." Said one of the crew members as he spew foam from his mouth. It was just as he said. Though the particle cannon mode was the trump card and the final form of blaster, it also had limited ammo. It had the power to shoot through thick armour as if it was made from paper. Without a doubt, it was not something intended to be used against a single human. Hidden behind the scenes in history ever since ancient times, a military clan that acted as mercenaries throughout the world. And the boy was said to be the greatest genius ever among the Renjou. "It’s not someone you can hold back against... everyone, shoot to kill!" *gachari*, all muzzles were directed towards him simultaneously. Even before the purple electricity appearing in front of the bullets, sparkling and crackling, the boy’s expression didn’t change at all. "...my little sister is waiting. I’ll have you let me pass quickly." Along with the voice, there was a flash of light. In the mansion of the Renjou’s main family, standing in the room at the top floor of the building, was a single man. A large man that had a body looking like Iwao, he quietly emitted a strong fighting spirit, in front of him was a katana——he picked up one of the two heirlooms of the Renjou family. Answering his voice, the door was blown away with a roar. Its centre was lying on the ground, squashed badly, it no longer looked like a door. The intruder’s name was Renjou Taiga. Just as his name stated, he was one of the Renjou. The terrifying enemy that drove away 80% of the combatants in Renjou’s main house that day. And met with his enemy, Renjou’s 33th generation’s family head, Taiga’s adoptive father, Renjou Gouki. "Although I feel indebted to you for bringing me up, that has been paid off a long time ago. It may be selfish of me, but I will live where I want, and do what I want. Am I wrong?" "You’re wrong. Even if our blood does not flow through your veins, all of Renjou lives in your body. You are the testament of our clan, that’s why you are not allowed to go. More precisely, you’re too dangerous to be allowed to go." *shichin*, the sharp sword was drawn from its sheath. One that’s classified as a nodachi, a large sword with nearly a meter long blade. This blade that could cut a human apart, was directed towards Taiga. Both of them looked for a chance to take down the other, they predicted each other’s actions. The sword wielding Gouki, and Taiga without a weapon. Gouki had the advantage. Without any visible trigger, both figures jumped in at the same time, a fist shot out at the same time as the katana slashed. The blade’s edge didn’t reach the boy, it flew towards the sky in vain. And from Gouki’s mouth... crimson red liquid was spit on the floor. "Sorry father, I’ve held back so you won’t die." Taiga muttered with his left fist embedded in Gouki’s side, he pulled his fist away. After receiving the blow, his father’s body rolled to the floor casually. He barely retained consciousness, and his eyes were thinly opened. "...what do you...plan...to do now..."
"Pack up and leave, I came here because I forgot something." He replied dutifully to the hoarse voice, he took the other heirloom in his hands and swung it. He clenched his hand on its grip to make sure it felt familiar. "Probably, we won’t meet ever again." That was what he conveyed in the end, and calmly walked away. Some people who lack information might think there was a bad relationship between them because they’re not blood-related. After 8 long years, they could finally relate to each other, until the end, that wasn’t the case. "...I’ve lived here for 8 years, I’ve grown attached in a way." After defeating his father, and taking down all his pursuers, he finally regained silence. Taiga’s figure was visible in the forest. Sky-blue eyes that would not disappear, could be seen even in darkness, staring. Renjou’s house was already far away. After looking behind at it, as if burning the scene in his eyes in the end, he started walking once again. "I’m no longer Renjou Taiga. My name is——"
"I’m no longer Karasuba Fuyuki. Little Sister’s name is——"
The time that stopped for the siblings 8 years ago, started flowing once more. Brocon and siscon....interesting, I'm looking forward to this. Taiga and Fuyuki... like Taiga Fujimura(Kendo-master who is the legal guardian of the protagonist of the extremely popular Fate/ franchise), the Tiger of Fuyuki(Fuyuki City is the setting of the Fate/ franchise in most cases)??? Looks like an excessive garry stu story...I wonder what made you pick it up? Woo!~ Interesting, a pair of genius sibling, wait are they twins?